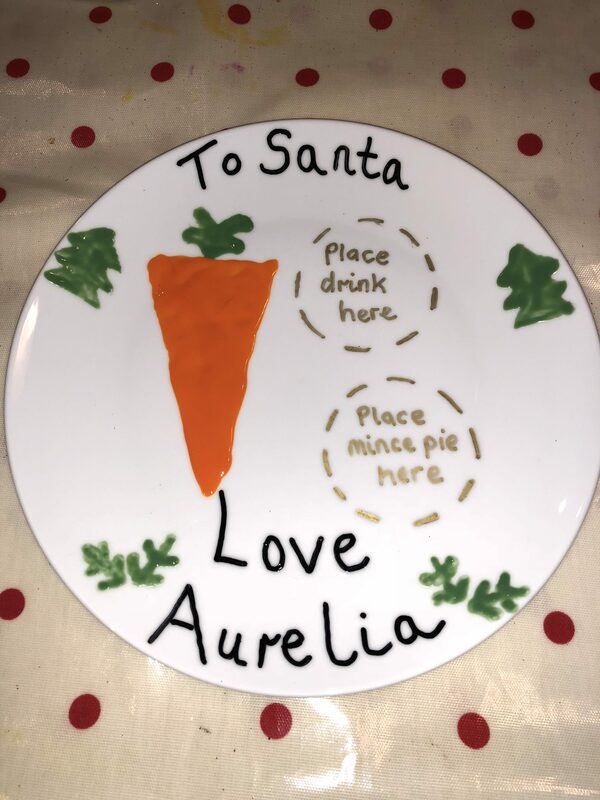 Do your children leave treats for Santa and Rudolph. Do you use a normal dinner plate or do they have something as special as this? It’s the most easiest and magical way to excited children on Christmas Eve. 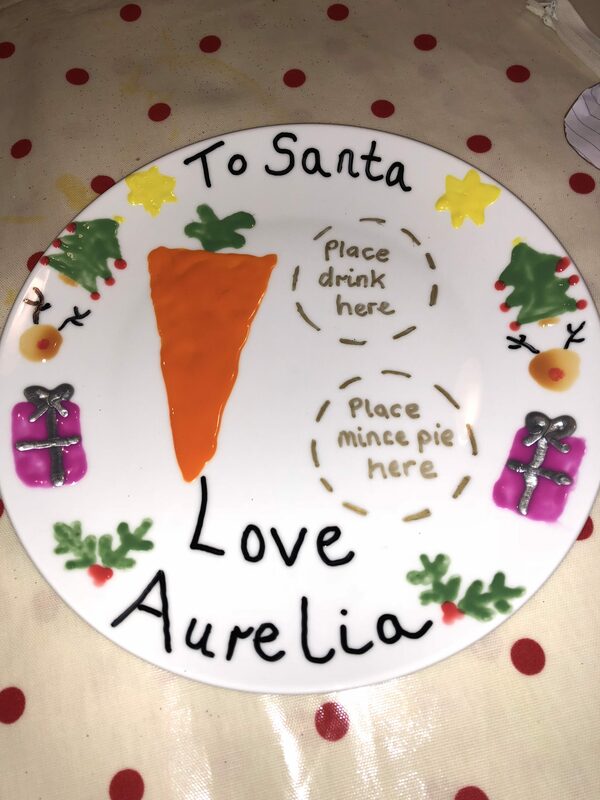 All you need is a plain dinner plate, some ceramic paint and/or pens. Follow these steps and you will have your very own plate. Alternatively you can order one through my Facebook page. However it maybe too late for this year! Wash and dry the plate. Work out how many letters are in the name(s) and if you want Father Christmas or Santa or what ever you may call him. From this work out the middle letter(s) of the name(s) and Santa’s. 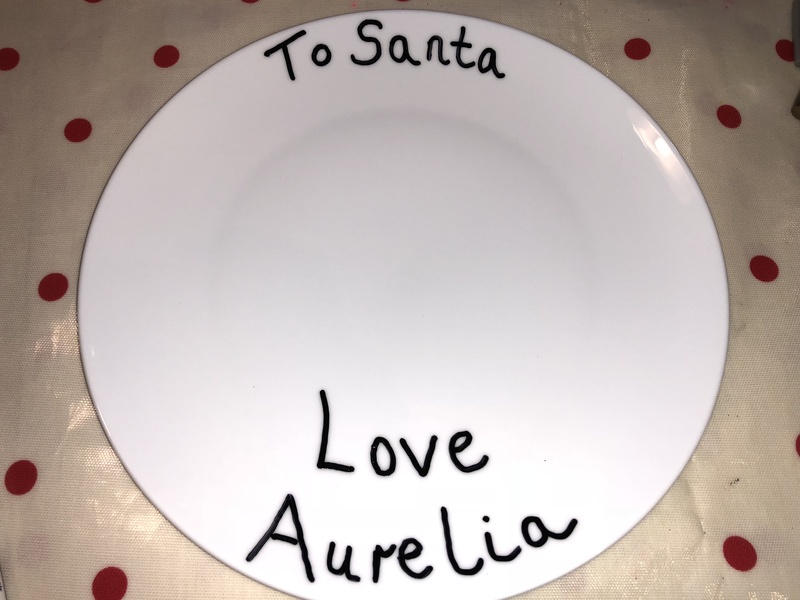 Using your ceramic paint pen write Love just inside of the plate rim. 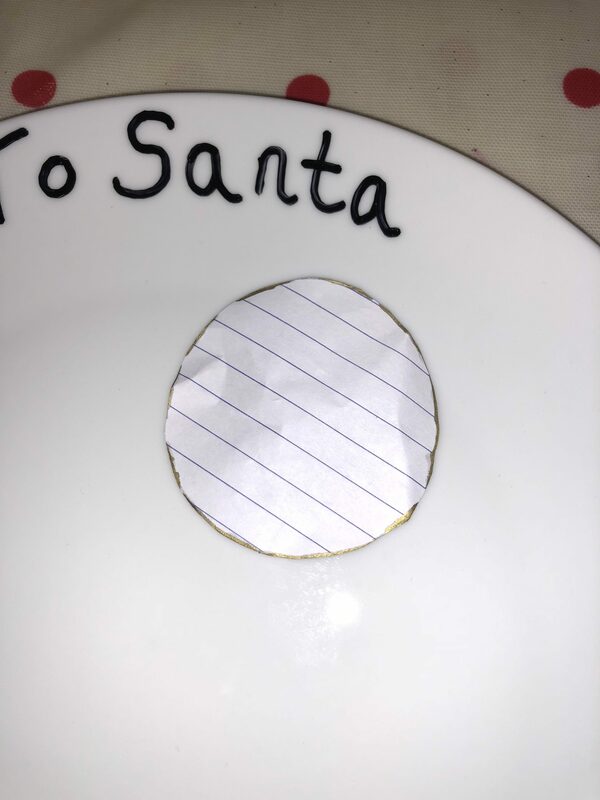 Then underneath (on the rim) work the middle of the name out and on the top rim write To Santa. Again working from the middle letter(s) out. Create yourself a template sizing wise mine is the bottom of a mug. Cut this out and draw around the template with a dot dot line. This can be in any colour you would like. I used the Sharpie Gold colour. You need to have two circles one below the other. Mine is on the right hand side but however you would like. 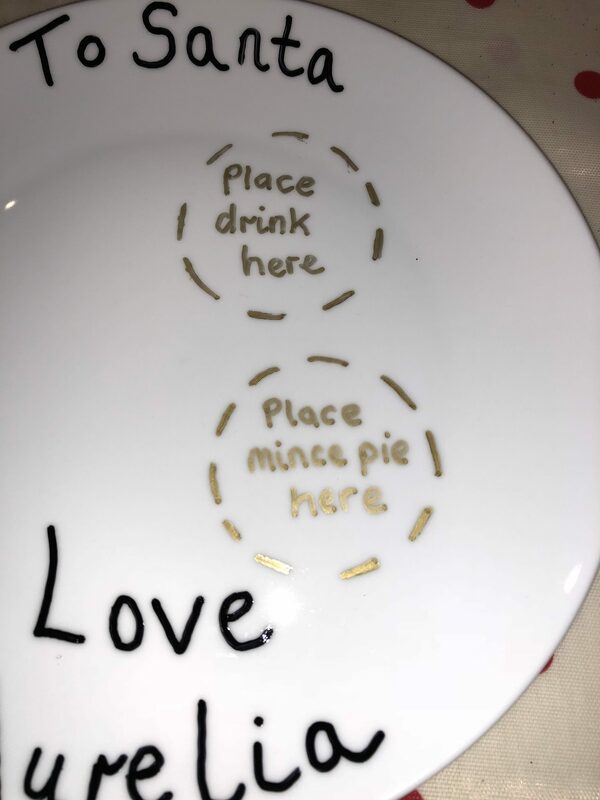 In the circles the top I write ‘Place Drink Here’ and the bottom circle ‘Place Mince Pie Here’. Obviously adapted to whatever you would like to write. Using your ceramic paint, squirt out a line of orange to start forming the carrot. Using a paintbrush, spread the paint out to create the carrot triangle. Using your green ceramic paint, again squirt out a splodge of paint. Using a paintbrush create the grass sprouting off the carrot. Next is to create the pattern around the rim. Its up to you really. 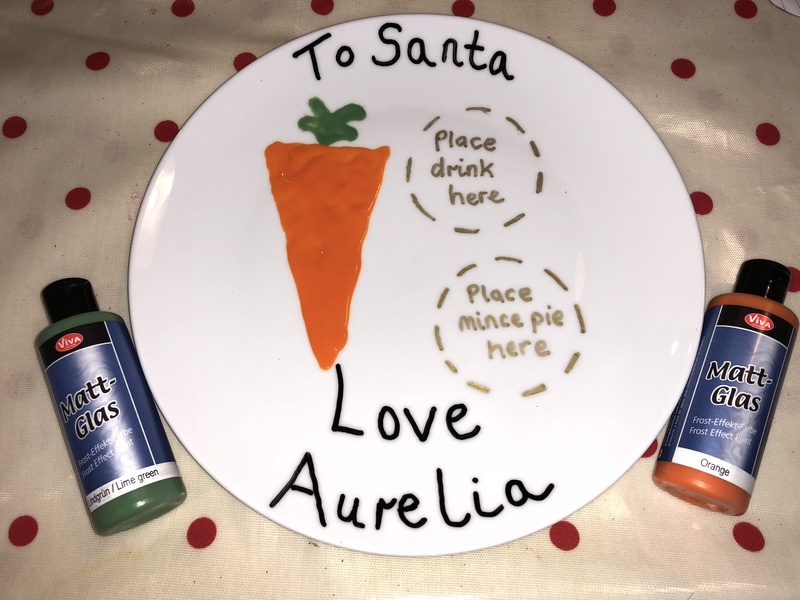 I paint holly each side of the name, a star each side of To Santa, then a tree, present and Rudolph to fill in the edges. This is just a suggestion its completely up to you. Once you are happy with your plate leave to dry. Depending on paint, I would suggest overnight. 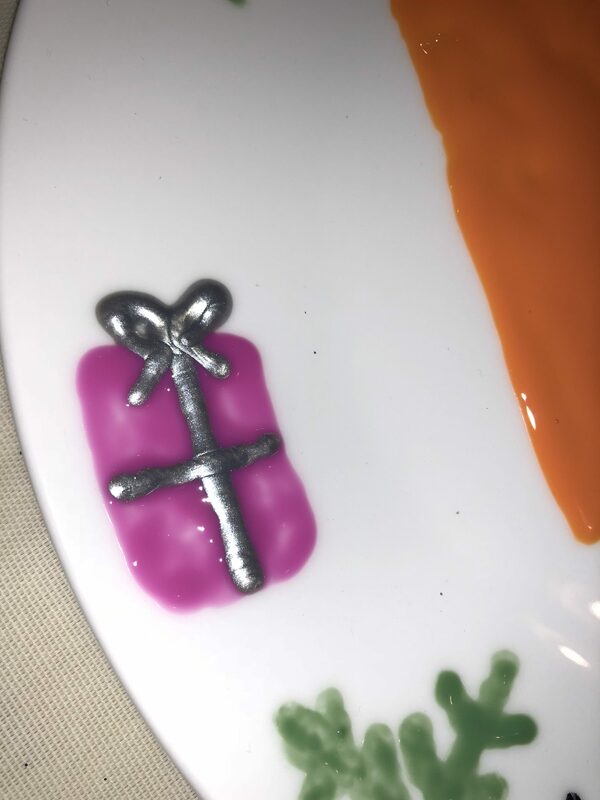 Following the paint directions bake your plate in the oven. Please note your plate will be dry wipe clean only. And thats it! Them simple 10 steps and you have yourself very happy children excited for Santa to visit. What did or do you leave out for Santa? I always remember leaving jam sandwiches or jam tarts and Ribenna and Lemonade because that was my favourite drink as a child.